In part 1 we saw the key role of SLS. It can clean oil off hair by causing the oil to dissolve in water. This oil film on hair is the main source of dirt. The oil film that surrounds the hair allows dust, fluff, lint, smoke particles, dead cells etc to stay attached to hair. Getting rid of this oil film is the principle function of SLS. The next question is does SLS break hair? Breaking hair is not quite the right term. 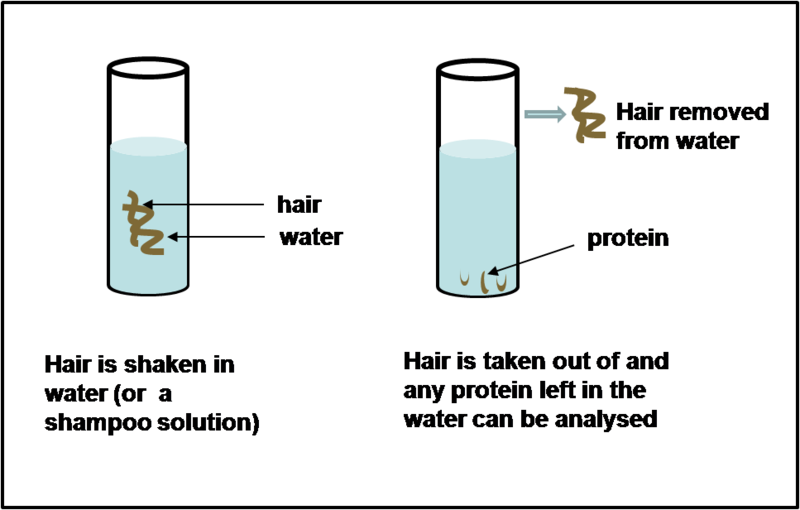 When hair is washed even with plain water, some protein will be found in the water. 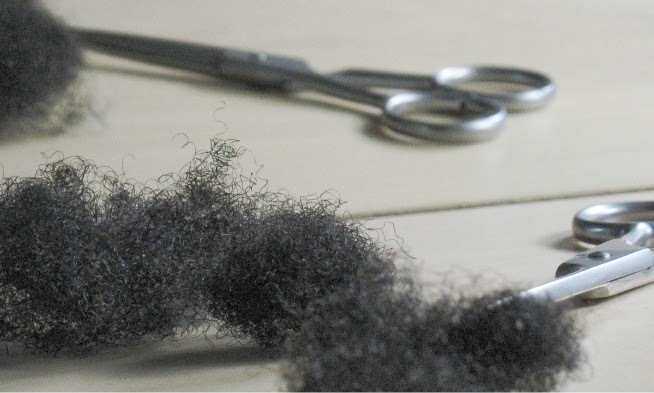 This may in part come from breakage but it may also result from normal wear of hair (i.e part of the cuticle is already weak and then falls off). 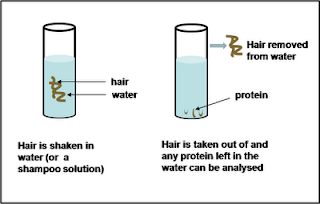 How do we know that protein comes off when hair is washed? The simplest test is to place some hair in a container of water and shake it around. After a few hours, the hair is removed and the water is tested to see how much protein came off the hair. How much protein comes off? Not much is the answer. One study which performed this test for 24 hours with different solutions is really useful for our purposes. (J Soc Cosmet Chem, pp163-175,1993). Here is a table showing how much protein they detected in the study. Taking water as our baseline, we can see that not all sulfates were created equal. Highlighted in yellow, the very effective cleansers have more protein debris than water. However other sulfates have less protein compared to water (highlighted in green). Is there evidence that using SLS causes hair breakage? In my opinion this is stating the obvious. Studies looking at how hair changes as it gets older have already documented that the hair cuticle is significantly depleted and completely absent around the 20 inch mark (around 3 years assuming a 6 inch per year growth rate). (J Soc Cosmet Chem, pp 155-175, 1977). Cuticle wear is more related to hair care practices than SLS use. To cut a long story short, any time you handle your hair, you damage it. There is no way to eliminate this but the damage sustained can be minimised by gentle handling of hair. Note for accuracy: Using the word sulfate (sulphate) is not quite accurate. The sulfate part of sodium lauryl sulfate is actually pretty harmless. However in the curly world , the term sulfate shampoo is commonly recognized. Great job! I can't wait for the next part. Maybe I should look for shampoo with those sulfates highlighted in green. Did they do this study on all hair types? A hair study on all hair types that is supremely rare! Dark brown hair is the description for that particular study. Wow! Amazing! Thanks for breaking it down for us laymen. So do you think that hairloss and hair breakage can be use interchangeably. Is it the same thing? I mean, hair loss is hair loss, right? Am I off? This is very informative and quite interesting, Jc! Hi Addy, no hair loss and breakage are two different things, unfortunately people use them interchangeably. Hair loss is specific to hair being lost from the follicle and/or failing to grow from the follicle. Oh alright, thanks for clearing that up! Ooooohh this is such great information. I know I've read before that sulfates cause protein loss but I never had the details. I wonder if there are any studies on other cleansers like coco betaine. I will definitely keep using coconut oil...hopefully that will help combat some of the protein loss from regular maintenance. I hear you take request? If so, can you tell me the affects of Cashmere and Collagen to the hair? Got2B added those two ingredients to their new line. Does collagen really give volume to hair? Does Cashmere really make your hair soft? Thanks for your patience. Anon - Yes I do take requests. I can refer you to look at the post that I did on proteins specifically hydrolyzed protein. Collagen may be useful if it is hydrolyzed (hydrolysed/hydrolised). Cashmere is new to me. I guess like wool it would be a protein too. I really doubt there is research on it. I will look it up. So would you say I'm safe with using my SLES containing Fructis shampoo once a week and my coco betaine containing Neobio shampoo for my mid-week washing? I'm not a co-wash fan. lol Yvonne, I am not a strict co-wash fan either. From this study it looks like SLES is 'gentler' and coco betaine is not a particularly strong surfactant compared to SLS so perhaps these two in combination may be effective. Can coco betaine be used in combination with a conditioner containing amodimethicones or would this lead to major build-up. I've been thinking about doing this for a while. Do amodimethicones behave like these bis-aminopropyl dimethicones. If not I could always switch do Pantene or Herbal Essences condis. I'm thinking of using an SLS or SLES shampoo only once a month and after I have been swimming in chlorine water which I don't do very often. Do you think rassoul clay can really clean? Do you know of any shampoos specifically that contain SLES and SDES? Sorry I don't DJ. You will unfortunately have to spend a few minutes in the shampoo aisle. I see that you are picking the 'gentlest' ingredients. Perhaps you might want to consider a sulfate free shampoo instead? Hi JC, I've read through many of you articles and have re-read through many. Finding your website has thoroughly helped my hair rentention journey! So I do want to thank you for all your efforts and research about hair, it is truly and deeply appreciated. I do have one question about surfactants and protein loss. How much protien loss would be produced from a non-ionic or zwitter-ionic surfactant? I understand that non-ionic surfactant are still surfactants. And they do remove oil; however, they do not remove them as well as anionic surfactants, because of the micelle's tail length difference for trapping oils? (I think? Please clear me up if I'm wrong.) I would be really interested in finding out! Thank you again for all your help. Thanks for reading through the blog. I just did a quick search and I cannot find any studies on the protein loss from non-ionic or zwitterionic surfactants. My theory would be that they would induce the least protein loss because they do not cause hair to swell much at all (less than water). I just happened to run across this blog and article and found it very interesting. My 6 year old was looking over my shoulder and saw the graphic with the tubes of water and started asking question (he likes science). So I read the article to him and he asked lots of questions. So GOOD JOB for creating a understandable article for the laymen adults and science minded 6 years old kids. Nice post! I will add it to the sources of my next post :) Thank you.